I purchased this ring and my now fiance loves it and so does everyone else. My family, her family and her co workers love the ring and the shine!! I believe its worth every penny and definitely worth the smile it has brought to my Queens face! 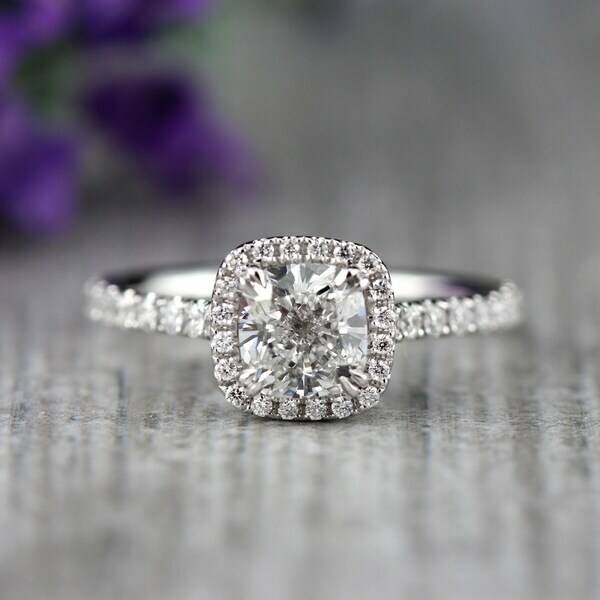 This 2 Carat Cushion-Cut Halo Diamond Ring by Auriya features a certified 1 1/5 carat, pillow shaped, cushion-cut diamond, elegantly framed in a halo of sparkling round diamonds that line the delicate, cathedral-style shank and shimmer from the crown of the halo intensifying the center-stone and providing a stunning sparkle and fire from every angle. This diamond ring is designed to last a lifetime and includes a 5-year limited warranty and EGL Certification. Available in your choice of 18k Yellow Gold, White Gold or Rose Gold that shines with a lasting high-polish finish. Dimensions 14.0 In. X 12.0 In. X 3.0 In. Whether you want to get the most bling for your buck or customize to your heart's content, choosing an engagement ring is a big decision. Let us guide you through all the ins and outs of finding the perfect ring. How to Clean an Engagement Ring from Overstock.com. Learn the right and wrong ways to clean a diamond engagement ring to keep it looking beautiful. Luckily, it isn't difficult to clean a diamond ring at home.